With six swimming beaches, 20 (warmer) kettle ponds, a forest that invites exploration on foot or bike, scenic outlooks, lighthouses, dune-buggy tours, and ranger-led events, there’s plenty to do without leaving the Cape Cod National Seashore in Massachusetts, the miles of dunes, beach, and wild lands in the heart of one of the most popular summer destinations in the country. The Cape Cod National Seashore is a haven for beach bums, nature lovers, history buffs and sea worshipers. Here’s what to see, do and eat in each town along the way. Kettle ponds formed when the ice sheets retreated around 18,000 years ago. They’re ideal for children and are usually around 10 degrees warmer than the ocean. Most are operated as town swimming beaches. Great Pond, Gull Pond, and Long Pond are the more popular bodies of water, set right off main roads. Visitors can also rent canoes, kayaks, or stand-up paddle boards to use here. The best time to visit Cape Cod is May, June, September or October. These shoulder months have pleasant temperatures for outdoor activities, fewer crowds than the busy summer season and reasonable room rates. 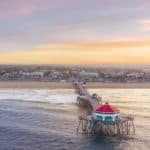 Visiting between July and August is best if hitting the beach is a top priority for you, but you’ll shell out a pretty penny for a seaside cottage during the peak tourist season. In contrast, the Cape is near abandoned from December through March and hotel prices are much less expensive than the warmer months, though many shops and restaurants close in the off season. If you’re looking for some time to curl up with a good book in quiet solitude, winter is the time for you. Popular with bikers, roller bladers and horseback riders, this 22-mile paved trail is a breezy ride through the Lower Cape’s diverse ecosystems. 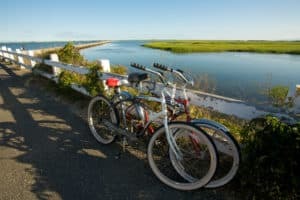 Previously known as the Old Colony Railroad corridor, the Cape Cod Rail Trail is considered one of the best bike trails in New England. Nauset Light, is the most famous and photographed lighthouse on Cape Cod, is located within the Cape Cod National Coast. It is an important part of Easthams cultural and maritime history. 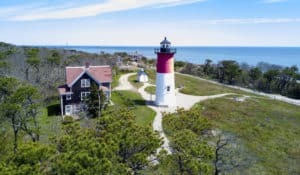 Nauset Light is helping private fleets and uses of small sailing boats that sail near the coast it is also important to note that the lighthouse is no longer under the auspices of the United States Coast Guard. 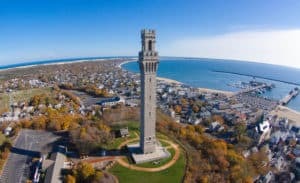 The Cape Cod Pilgrim Memorial Association built the Pilgrim Monument to honor the Pilgrims’ first landing in Provincetown. President Theodore Roosevelt laid the cornerstone in 1907. In 1910, President William Howard Taft dedicated the finished 252-foot tower. In 1910, the Cape’s first building built to house a museum opened at the base of the monument, to educate the public about Provincetown’s role in Pilgrim history and American history. 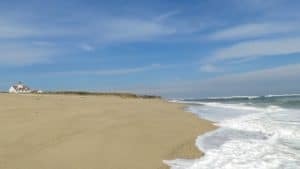 With more than 7,600 acres of protected dunes, salt and freshwater marshes and a decommissioned lighthouse, the gorgeous Monomoy National Wildlife Refuge will make you feel like a trailblazer. 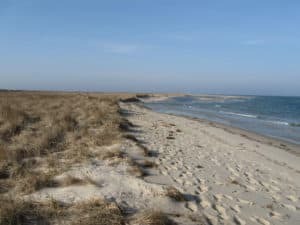 But there’s more than rugged scenery; the encompassing islands of Morris, and North and South Monomoy are a nesting habitat for hundreds of species of migratory seabirds. Off the coast of South Monomoy, a large harbor grey seal population congregates to mate, play and sun themselves on the shore. Coast Guard Beach is a prime swimming beach during the summer season. From mid-June to Labor Day, the parking area at this location is closed to all but park staff and visitors who are disabled, and access is provided by shuttle bus from the Little Creek parking area. There are seasonal restrooms and a wheelchair-accessible ramp way to the beach. 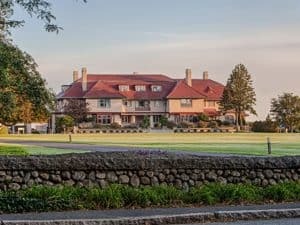 Any visitor of this property will tell you how beautiful and impressive they find Wequassett Resort and Golf Club. Then they’ll probably rave about renting a boat, putting on the greens, lounging poolside, or any of the many other activities available to resort guests. Perhaps a recounting of the tasty seafood dish they ate at Twenty-eight Atlantic will follow. Basically, this hotel gets kudos upon kudos from travelers and experts alike for its variety of amenities and elegant accommodations. Rooms and suites are appointed with spacious patios, gas fireplaces and flat-screen TVs. For most guests, these things make the perfect Cape Cod getaway. For more information, pricing or to reserve your room visit the Wequassett Resort & Golf Club. Since 1914, the Chatham Bars Inn has been a cozy oceanfront retreat that beckons to Cape Cod visitors with its laid-back luxury. The nautical color palette extends to the hotel’s guest rooms and cottages, which guests adore for their seaside views and massive wraparound porches. Accommodations are equipped with Bose Wave radios, L’Occitane toiletries and Nespresso coffee makers. The New England-inspired fare dining venues STARS, The Sacred Cod, The Beach House and The Veranda, earns rave reviews. For more information, pricing or to reserve your room visit the Chatham Bars Inn. With 429 acres to host a Jack Nicklaus-designed golf course, miles of coastline, several tennis courts, a 26-mile bike trail and five pools (including two indoor), the Ocean Edge Resort & Golf Club stacks up well against its Cape Cod competitors by the numbers. Rooms come in two main types: villas available on one portion of the property and guest rooms or suites inside the main building called “The Mansion.” All types feature entertainment centers, coffee makers and sofa beds. For more information, pricing or to reserve your room visit the Mansion at Ocean Edge Resort & Golf Club. Accommodations are spread out across nine historical buildings that have been fully restored. Ranging from a classic queen room to a penthouse suite, all of the 43 accommodations are individually decorated and include coffee makers, flat-screen TVs, complimentary Wi-Fi access and minifridges. Guests can also take advantage of the on-site infinity pool or 12-person whirlpool, along with the expansive gardens and courtyard. For more information, pricing or to reserve your room visit the Brass Key Guesthouse. The unique Belfry Inn & Bistro is located right in downtown Sandwich, Massachusetts, about a mile from the coast. 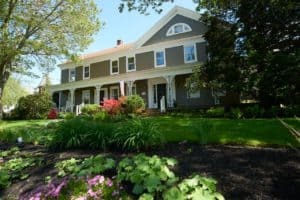 Housed in a renovated church, which was built in 1901, the inn boasts a one-of-a-kind experience, having maintained much of the structural and decorative elements of the original building. The on-site Belfry Bistro offers fine dining and complimentary breakfast daily for guests. The Belfry Bistro also hosts various live music series, complete with drink specials. Inside each of the inn’s 22 accommodations, visitors will find a cable TV, Wi-Fi access and a soaking tub. Many rooms have balconies and fireplaces too. For more information, pricing or to reserve your room visit the Belfry Inn & Bistro. Cape cod looks beautiful. As you mentioned it is ideal for beach lovers, I would very much like to explore this beautiful destination. I have explored California and Florida beaches but never been to Cape Cod National Seashore. The light house looks stunning and I’m always fascinated by light house destination. So this place is a must in my travel list. Sounds like the perfect fit for you Demi. It will exceed your expectations, knowing you have been to Florida and California. Unique in it’s own way but absolutely beautiful! 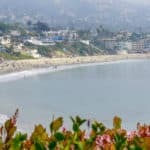 Six swimming beaches got immediately my attention. It’s so damn far from me but I will find the time to visit this gorgeous place too. Thanks for the thorough and useful depiction! You are very welcome, and it will be so worth it! You will fall in love with Cape Cod! Wowzas!! The vast landscape the beautiful vistas! Cape cod looks so magnificent! I remember visiting there as a child but have yet to experience it as a parent. The various ponds that yield higher temperatures for the little ones sounds exactly like something me and my little seven year old would totally love to check out! Great post and chalk full of really helpful tips and information. Oh, wow, Cape Code is stunning! I have traveled to many places, but to Cape Code, never. The hotels are beautiful. The one that I’ll choose is the Brass Key Guesthouse. It must be quite expensive, but worth the price. Also, we love biking with our kids when we are on vacation, it’s fun and great for health. Do we have to have to book the activities and the hotel separately or it comes with the hotel package? You will have to book your activities separately, but the hotel can help you with that. Just keep in mind, because you do mention your kids, that the Brass Key Guesthouse is an adults only hotel, and does not allow anyone under 18 to stay at the hotel. Let me know if you have any additional questions. Wow! I had no idea there was such a beautiful seashore in the Cape Cod area. My only experience is from what you see in the movies, usually a ferry heading somewhere. You did such a wonderful job showing us when to visit depending on personal preferences and listing the available attractions. I can see my wife and I biking down the Cape Cod Rail Trail in the spring or fall months. We generally head a little further south when we visit the east coast. You have definitely piqued my interest in expanding our horizons. We love a good restaurant and your review shows there’s no shortage of options. I’d have a hard time deciding on one of the accommodations you have so wonderfully described. Thank you for opening my eyes to such a beautiful National Seashore. You are very welcome Randy. Yes, you do need to expand your horizons for sure. This is a wonderful area and I live in Florida where there is no shortage of beautiful beaches. 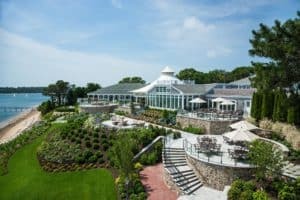 Cape Cod is unique and worth vacationing too. Thanks for visiting beach travel destinations. Thank you for this post Leahrae, now you are making me want to go to Cape Cod. The photographs are so great. I think I would love to visit In September or October. They are the months I like to relax before it gets Christmas busy. And the hotel that tickles my fancy is the Brass Key Guesthouse. Good choice on hotels Juliet and I never thought of it that way, traveling before the hectic Christmas season. I like that idea! 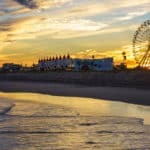 I’ve never been to Cape Cod before but after reading this post it’s very hard not to think about booking a trip! It seems like it has many different beautiful scenery attractions which is great for me because I love the outdoors! 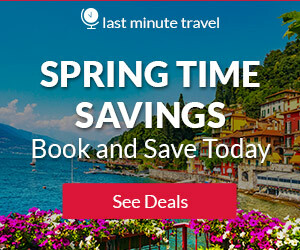 I will be bookmarking this website for future trips! Glad you enjoyed visiting the Cape Cod National Seashore. Thanks for stopping by! Great, I am glad you are enjoying your visits to beach travel destinations and the Cape Cod National Seashore. Thanks for stopping by! Amazing and insightful write up on the Cape Cod national seashore I must say, I wondered while reading about if the six beaches and twenty ponds are natural ponds or if they were artificial, I was also stunned by the Cape Cod rail trail, it was an eye catcher for me, the fact that the best visiting times are may – June may not work for me, but September to October will definitely work for me. Best regards. None of the beaches or kettle ponds are artificial. All are natural with wonderful natural beauty. If heading to Cape Cod, a bike trip on the rail trail is definitely a must. I hope you can make it to Cape Cod National Seashore soon. Thanks for stopping by. Hi Leahrae, first things first, I absolutely love your website. It’s exactly what I’ve been looking for. Since I love cycling, hate cold water and prefer secluded, windy beaches I believe Cape Cod wins over San Gregorio, I checked before. Should I bring a bicycle with me or they have a rental in town? I would love to do a Rail trail and visit the Lighthouse. Hi Katya, I love windy beaches too! I don’t get too hot when there is always a breeze. You will find bike rentals there, so no need to tug along your bicycle. The best place to rent bikes from is Little Capistrano Bike Shop. Please let me know if you have any other questions. Thank you for visiting beach travel destinations. Thanks for giving a beautiful presentation of nice places to visit in Cape Cod, MA. I wonder how far they are from MIT. One of my children has hopes of attending MIT and that would be a great opportunity to visit these places. You also have a wonderful lineup of nice places to eat and stay. This is a very useful article. Thank you 🙂 It’s only about an hour and a half drive from MIT. That’s not too far! You can visit your college son/daughter and visit Cape Cod or take them there for the weekend. Nice! I’ve never been to Massachusetts before, but Cape Cod National Seashore sounds like a great place to visit! I will surely bookmark this page! You captured my attention in the first few sentences! With several swimming beaches to choose from, the kettle ponds, places to walk and ride bikes, beautiful scenery. I love to see different lighthouses too! Sounds like a great vacation idea. I like the idea of the dune-buggy tours as well. I’ve always wanted to do that. Thanks for sharing another great vacation idea; 1 more on my bookmark list! I know I keep growing your bookmarks and hopefully your bucket list for vacations 🙂 It is really a beautiful area to vacation to, and plenty for the whole family. Dune buggies are a blast! If you ask a European citizen about beaches in the US he will mention California or possibly Florida. Every time I visit your website I realize that there are lots of really amazing places to visit. The list is enormous and I don’t know which one I should choose. Cape cod is definitely one of my favorites. Great article Leahrae ! You are so right Effie! I have a lot of family in Germany and when they found out I moved to Florida, they all want to come visit. No when I was in Texas, there was zero interest. And I found Texas to be such a great place as well. Granted they don’t have the wonderful and tremendous about of coastline and beaches. But they do have beaches 🙂 Cape Cod National Seashore is just a wonderful place, and it is up there – hands down – with Florida and California! Wow, what a great review of everything Cape Cod National Seashore has to offer. I love biking, being from the Netherlands it is in my second nature. I did not know this region, but I am definitely interested in discovering it, it has such a wide variety of things to do and to see. Thanks for sharing! You are very welcome Karen. I am glad you learned about the Cape Cod National Seashore. It is a very beautiful place worth seeing in person 🙂 Thanks for stopping by beach travel destinations.